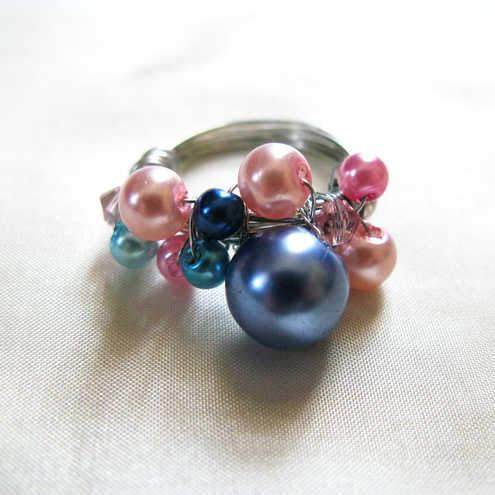 Folksy :: Buy "Fruity Coloured Rings"
Made from a mixture of 4mm bicone Swarovski Crystals, matched with 4mm glass pearls and 8 - 10mm seashell pearls. The lovely beads are twirled on a silver plated vine of wire, which is then wrapped on a handmade silver plated wire wrapped ring. Earrings will come in a gorgeous gift pouch. Ideal as a gift or to add to your own fine jewellery collection. Gift pouch will then be carefully wrapped before posting. Folksy :: Buy "Blue Berries Bracelet"
Folksy :: Buy "Black and White Rings"
Folksy :: Buy "Pink Hearts Necklace"
Folksy :: Buy "Black Rose Ring"